It’s that Comfort Food time of year again. My lawn is a sea of brown and yellow leaves, the trees are nearly bare, and today brought the season’s first snow flurries, swirling about every which way in the wind. 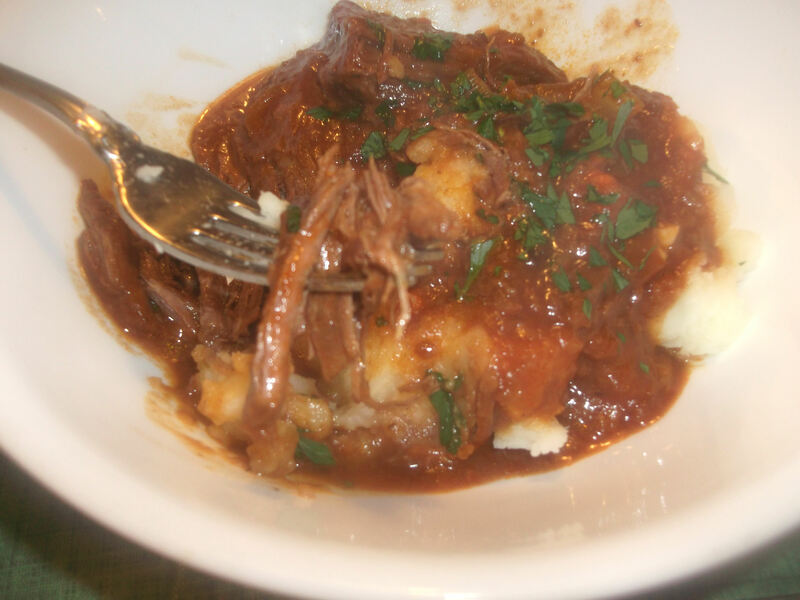 The clouds and cool temperatures prompted me to fire up my crock pot and seek solace with a warm and hearty meal. I ventured to the outdoor freezer and discovered an abundance of flank steak (I must have found a great sale), so my mom’s Swiss steak recipe fit the bill. 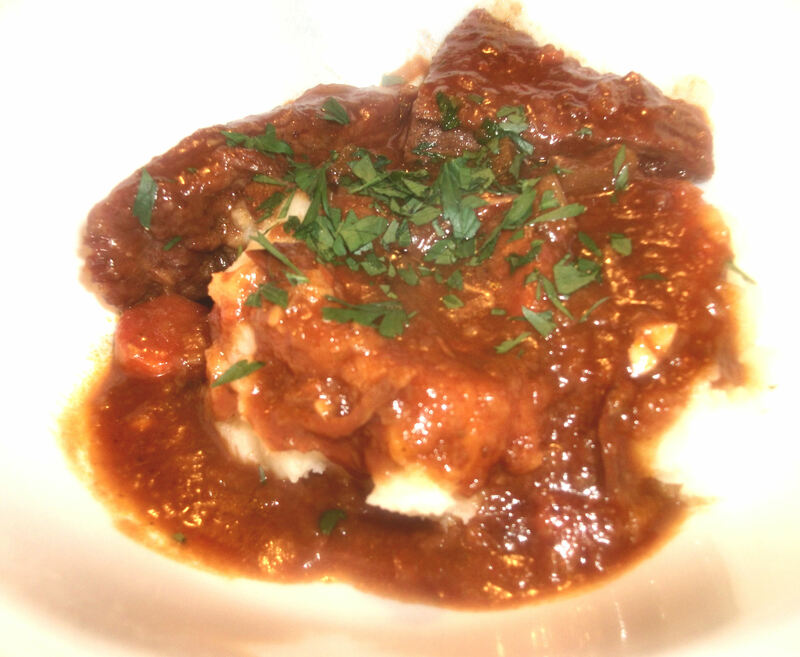 Nothing comforts a cold soul like a tried and true recipe from Mom! Optional first step: using a meat mallet, pound the steak until it is about ½” thick. Cut the steak into small pieces, roughly 3” x 3” each. Heat the oil in a large pan over medium high heat until very hot. 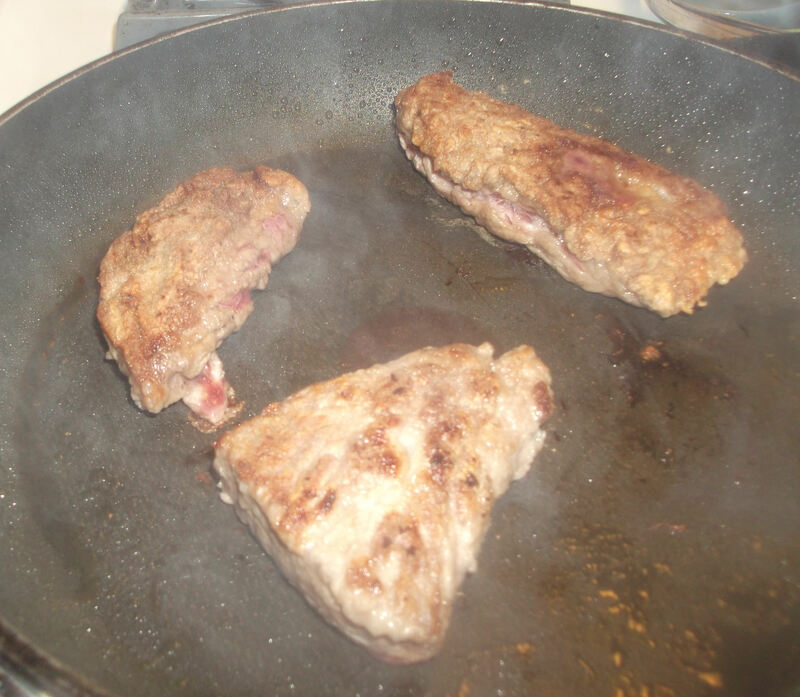 Dredge each piece of steak in flour and sear on both sides in the hot oil. Work in batches – don’t overcrowd the pan. Once browned, remove each piece of steak and place it in a crock pot. 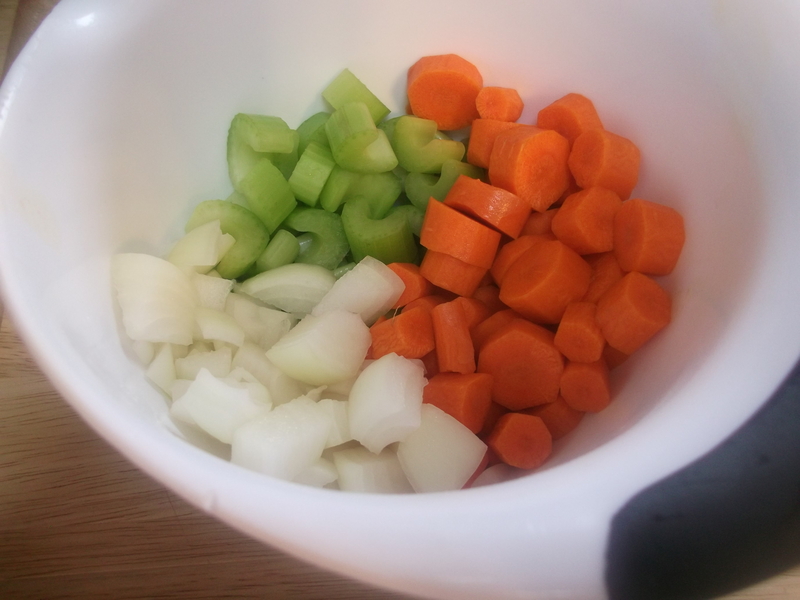 Add a little more oil if the pan is dry, and stir in the vegetables. Let them cook for a few minutes, then add the garlic: stir it in well and be careful not to let it burn. Add the Lipton’s packet and pour in one can of tomato juice/V8. Stir well to mix, and scrape up all the bits from the bottom of the pan. Pour the mixture into preheated crock pot. 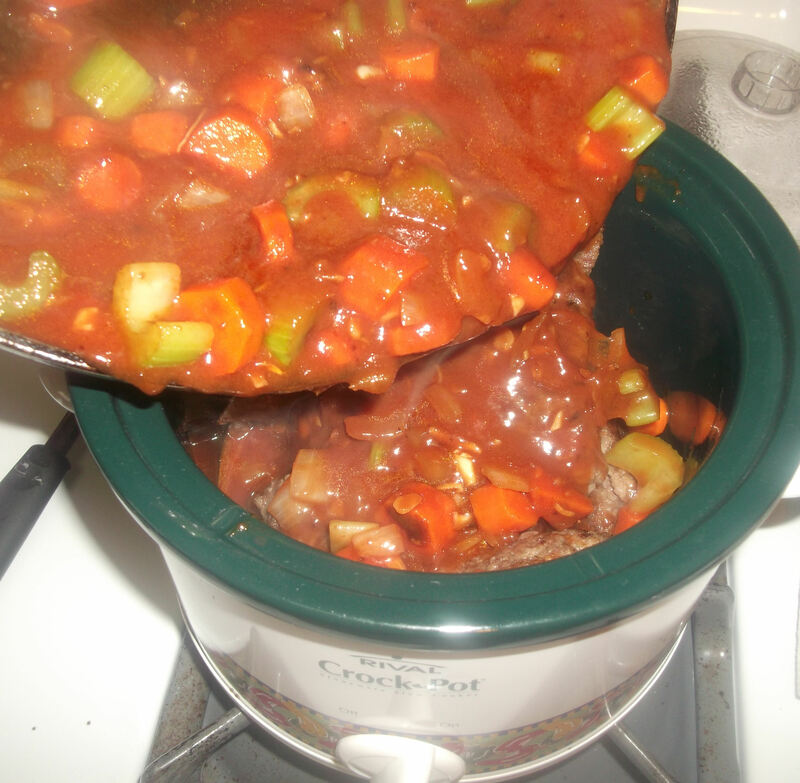 Top off the crock pot with tomato juice/V8 until the meat is completely covered. Cook on low 8-10 hours, or high 5-6 hours. This recipe is a great combination of scratch cooking along with some non-scratch ingredients. Before you start, turn on the crock pot. This step is kind of important. Optional first step: pound the steak with a meat mallet until to about ½” thick. 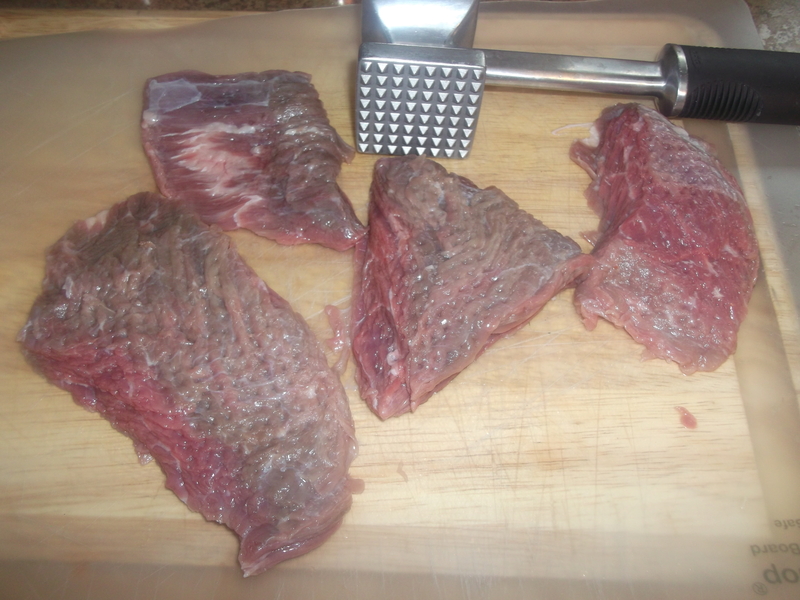 Especially with flank steak, the thickness varies so much I like to make it all a little more uniform. But it really doesn’t matter, as it’s all going to be completely tender by the time it’s done cooking anyway. 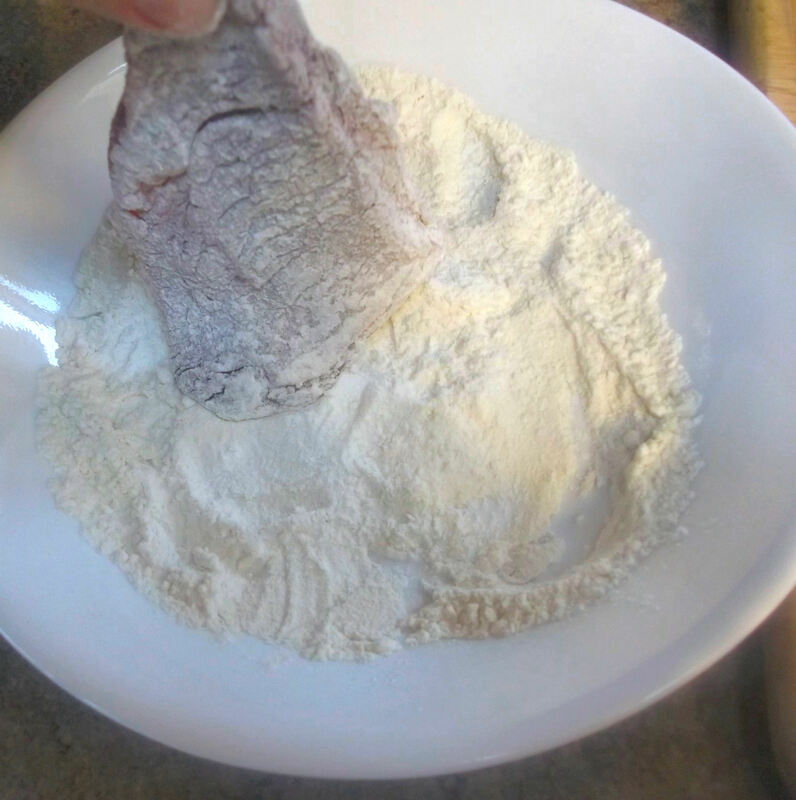 Dredge each piece of steak in flour, lightly coating each side. Gently shake off any excess and set aside. Heat the oil in a large pan over medium-high heat. When the oil is very hot (when a drop of water in the oil sizzles) add as many pieces of steak that fit comfortably in the pan and brown them on each side. Work in batches if all the pieces won’t fit in the pan – don’t overcrowd it. When they are nicely browned on one side, turn them over and brown the other side. While the steaks are browning, mince enough garlic to get about a tablespoon’s worth, and chop the vegetables coarsely (roughly ½” pieces). This will yield roughly a giant handful of each. 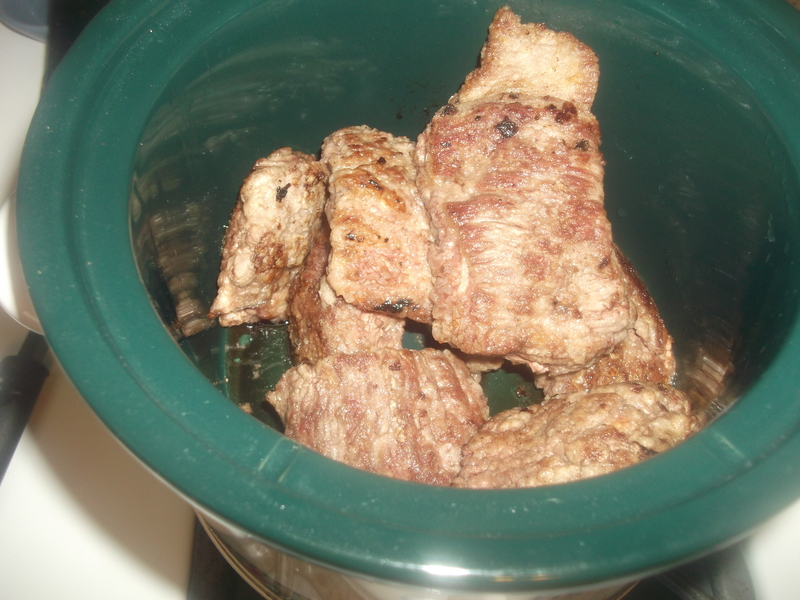 Once browned, remove the pieces of steak and place them in the crock pot. 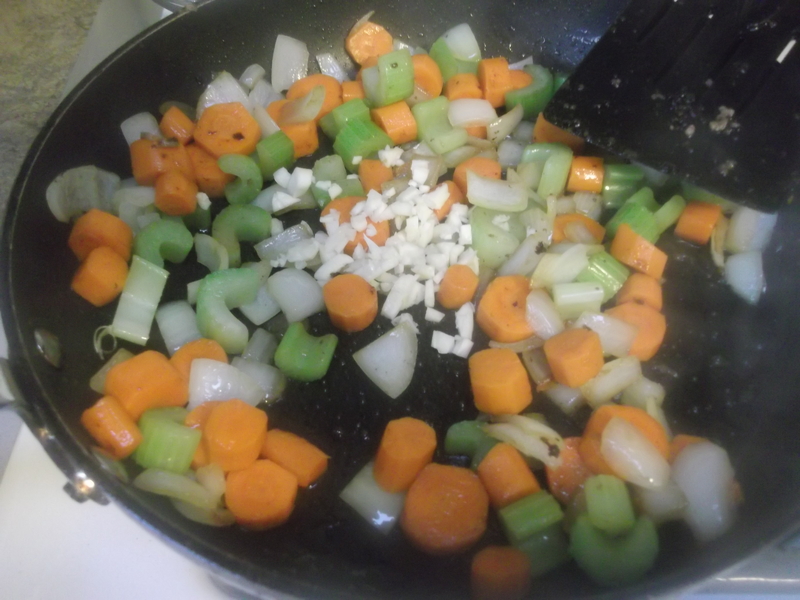 Add a little more oil to the pan if it is dry, and add the vegetables. Let them cook to soften for a few minutes, then add the garlic: stir it in well and be careful not to let it burn. 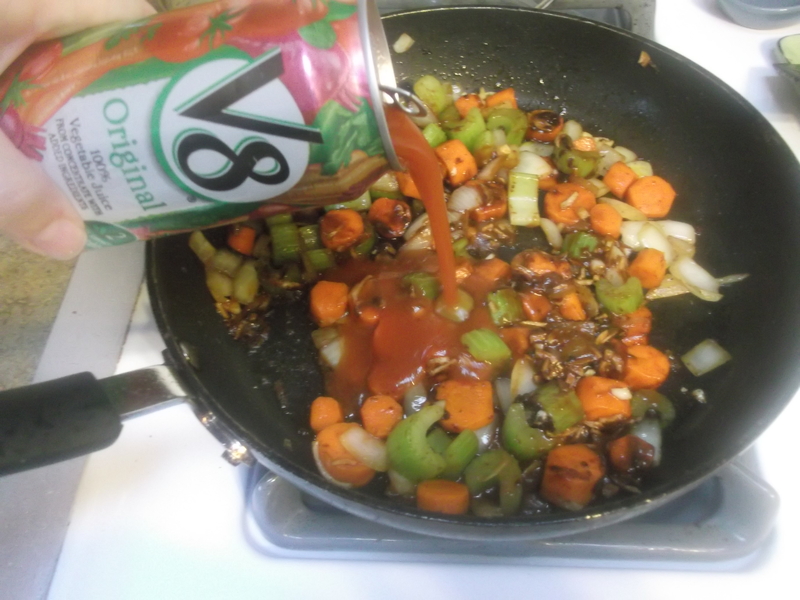 Add the contents of the Lipton’s packet and pour in one can of V8/tomato juice. Stir well to mix, scraping up all the bits from the bottom of the pan. Carefully pour the mixture into the crock pot. It helps if your pan is as wide as your crock pot. Mine wasn’t, so it took some extra effort to make sure it all arrived safely into the pot. Cook 8-10 hours on low, 5-6 hours on high, or until the steak is tender. 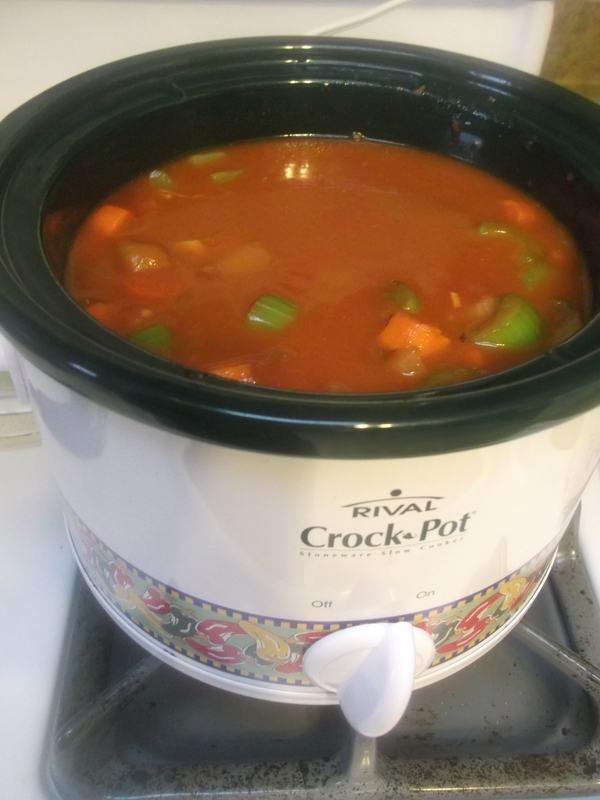 If your crock pot is like mine, and only has “On” or “Off,” 5-6 hours was plenty of time, so assume “On” is the same as “High.” Which means dinner is ready that much sooner! Season with salt and pepper to taste, and serve over mashed potatoes. Enjoy! Note: if you don’t have a crock pot, just let this simmer on the stove on a low setting, covered, for several hours.